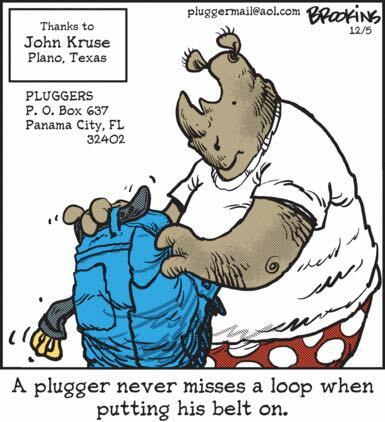 Usually, even though I resent and/or feel cruelly superior to any given installment of Pluggers, I at least understand what the point the panel is getting at is supposed to be, but I have to admit I’m at a loss here. Do … do the inhabitants of God-fearing locales like Plano assume that us big city liberals are too busy doing gay socialism to each other to take the proper care to put on our belts properly? Or is this an obscure fat joke that I’m just not getting? Which one of these creatures can see in complete dankness? Because every single one of them is high as hell.